Dave Seim (left) and Tom Guardia relax in our “rear area” which has beds in a building. The bed felt great but the tin roof made all of us nervous. 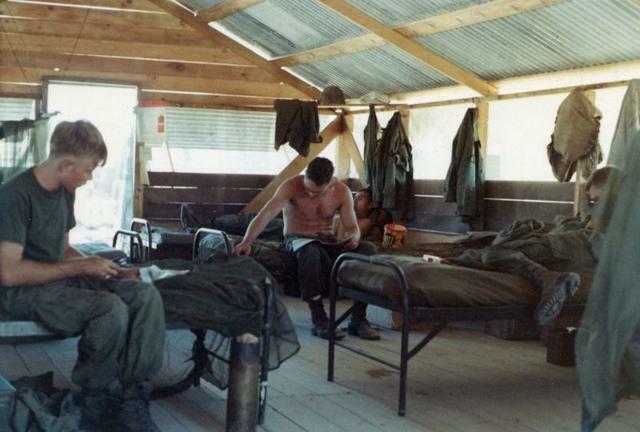 We were accustomed to living in a bunker (hole in the ground) with layers of sandbags overhead to stop mortar bombs. Rockets were more powerful and a direct hit would likely be fatal for those inside the fire direction control (FDC) bunker. Tom has a tin of stateside goodies. Today we will live the good life!